Nearly nine out of ten individuals age 65 and older receive Social Security benefits. Social Security benefits represent about 34% of the income of the elderly. Among elderly Social Security beneficiaries, 48% of married couples and 71% of unmarried persons receive 50% or more of their income from Social Security. Among elderly Social Security beneficiaries, 21% of married couples and about 43% of unmarried persons rely on Social Security for 90% or more of their income. 51% of the workforce in private industry has no private pension coverage. 31% of the workers report that they and/or their spouse have no savings set aside specifically for retirement. The average monthly benefit for retired workers as of May 2017 was $1,368. The SSA highlights some sobering statistics that confirm what studies have shown: most people have not saved enough for retirement. As a result, people are not determining their Social Security benefit timing. Instead, benefits usually begin immediately after gainful employment ends as their savings buffer is limited. For the prepared investors, such as Axia Advisory clients, the goal is to make an active decision on benefit commencement. 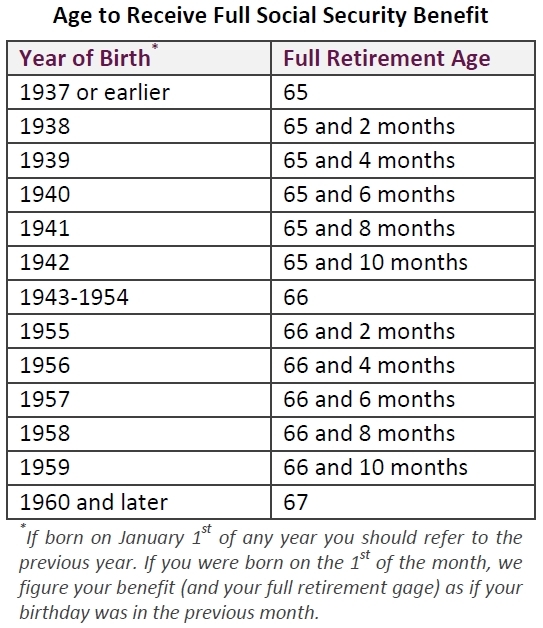 Full retirement age depends on your year of birth, but generally ranges from 65 to 67. Benefits can begin as early as 62, but are reduced substantially. For instance, a beneficiary with a full retirement age of 67 can retire at 62 with a 30% reduction in their monthly benefit. Waiting until age 65, the monthly benefit would still be reduced by 13.3%. On the other hand, delaying benefits beyond full retirement age increases the benefit by 2/3 of 1% each month, or 8% every year, for those with a full retirement age of 67. Benefits stop accruing after age 70, so it makes no sense to defer past that age. Beginning benefits later increases the monthly benefit, but pays over a shorter time-frame. In retirement, maintaining your standard of living is the goal. Claiming benefits is an important part of that goal, but a fairly convoluted process, especially for couples. There are a myriad of options and outcomes that depend on salary inputs, familial longevity estimates, current health, and working status, just to name a few. As a first planning step, free online tools are available to help optimize benefits. A few online calculators are listed below. It may also help to take a more holistic approach and include other retirement assets in the process as well. This may produce a withdrawal structure based on all assets that could postpone claiming social security and produce a higher inflation-proof benefit in retirement.